Learning and teaching history is hard work. The physical, mental, and emotional toll can be high, for both educators and learners. This is especially the case when it comes to traumatic histories. For educators, it is difficult to balance the desire to make an emotional impact on your students without inflicting (further) trauma. For learners, it is difficult to balance curiosity with respect. We are often implored to “never forget,” but we seldom take a moment to talk about what and how we are supposed to remember. All of us come to the field of history from different backgrounds, and the ways in which we interact with history as educators and learners are shaped by these early experiences. But, with certain exceptions, it remains rare for anyone to talk about this, especially when it comes to teaching. So in this blog post, I wanted to take the opportunity to talk about my personal experiences learning and teaching about traumatic histories and specifically how my experiences as a Jewish-Canadian woman who was taught about the Holocaust as a child shaped my approach to teaching first-year university students about residential schools. I was born and raised on the island of Montreal, the traditional territory of the Kanien’kehá:ka people, which was also a place of meeting and exchange for many nations. My family lived in the city of Côte Saint-Luc, an Anglophone enclave and home to the largest Jewish population on the island. My ancestors came from Russia, Poland, and Austria, and landed in North America between the 1890s and 1910s. At the time of my birth, I was the third generation of my family born in Canada. Once upon a time there was an evil man in Germany named Hitler. He didn’t like Jews, and neither did the German people. So, he decided that all of the Jews needed to be killed. He sent them to these places called “concentration camps.” When people got to the camps, the girls and boys were separated, and the guards took all their belongings. In groups, the girls and boys were told to go and take showers. They entered into the showers, expecting to wash, but that’s not what happened. Instead of water, gas came out of the showerheads. This was poisonous gas, and the people in the showers started to suffocate. They tried to use their fingernails to scratch through the doors. If you visit the showers today, you can still see the marks the people made with their nails. Once all the people were dead, other people would come to get them. The bodies would be dragged out of the shower and then put into ovens until they turned to ash. Another inspiration behind my approach came from an encounter that I had, when I was about sixteen, with an actual Holocaust survivor. Mr. L. was my neighbour’s grandfather, and he often drove us to school together. [i] One day, while waiting for my neighbour, he introduced me to a group of his friends, explaining that they, like him were Holocaust survivors. All of the men were so kind and genuinely happy to meet me and hear about my accomplishments. I don’t know if it’s something I concluded later, or if Mr. L mentioned it to me, but what I remember most about this encounter is that it seemed so important to these men to see a smart little Jewish girl who had every opportunity to succeed and do whatever she wanted with her life. I represented something that many Holocaust survivors never thought they would see: hope for the future. In many ways, I was a tangible reminder that their suffering and survival had not been in vain. I took this lesson to heart during my research. I wanted to teach residential school history in a way that was meaningful and emotional, but not hurtful; from a place of hope, not fear. I finally found my solution with the film, “We Were Children.”[ii] This film centres on the testimony of two residential school survivors, Lyna Hart (Nisichawayasihk Cree Nation) and Glen Anaquod (Muscowpetung First Nation), featuring their testimony alongside dramatic recreations of specific events. [iii] While it does not shy away from portraying the realities of residential schools, the focus of the film is on healing and resilience. While I cannot recommend this film highly enough, what sets it apart, at least for me, is the accompanying educational guide, developed by the NFB and Barbara Frazer, an Indigenous educator with the Legacy of Hope Foundation (LHF). [iv] The full guide takes about 2.5 hours to complete, though it is easy to adapt to any type of classroom setting. But there are two activities that I believe are essential: the opening activity on framing resilience and the Gift of Silence activity. 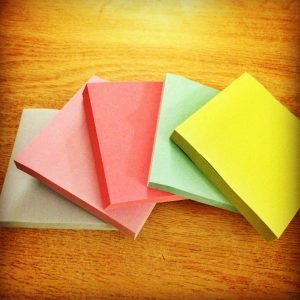 The first activity invites students and teachers, to reflect upon their own life experiences and share, through the use of anonymous post-it notes, traumatic events that have shaped their lives, with a particular emphasis on how these events were overcome. The ensuing discussion highlights the importance of support networks, resilience strategies, and coping mechanisms, and is designed to illustrate how many of these were taken away from students in residential schools. The second activity, the Gift of Silence, is a four-minute pause where students are invited to reflect upon the importance of silence within an Indigenous cultural context. 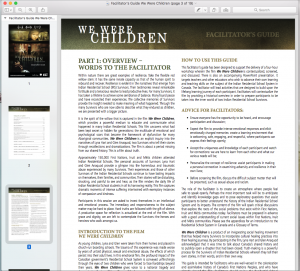 Screenshot of facilitator’s guide taken by author. I have facilitated these activities with my students twice now, and each time has been among the most profound educational experiences of my life. [v] Each time, the candor with which the students engaged in the Resilience activity, was remarkable. Many felt empowered to share stories of addiction, family violence, relationships, and conflicts. Our discussions, both before and after the film were compassionate, complex, and respectful. My students emphasized that the personal nature of the stories in “We Were Children,” the Resilience activity, and the Gift of Silence made them see the history of residential schools in a new light, to see that this history was real and immediate. And most importantly at all, at least for me, both Indigenous and non-Indigenous students were able to articulate the contemporary legacy of residential schools, and to consider the roles of Indigenous and non-Indigenous peoples in reconciliation. Most of us are familiar with the phrase, “the personal is historical.” However, I think the opposite is also true, that the historical is personal. Moving forward, it is my hope that more historians will talk about their personal relationship to history (whether as researchers or educators), and to engage in honest discussions about our approaches, successes, and failures. Andrea Eidinger is a historian of gender and ethnicity in postwar Canada. She holds a doctorate from the University of Victoria, and has spent the last six years teaching as a sessional instructor in British Columbia. She is the creator and writer behind the Unwritten Histories blog, which is dedicated to revealing hidden histories and the unwritten rules of the historical profession. [i] Name withheld to protect privacy. [iii] “We Were Children,” APTN Reel Insights, online at http://aptn.ca/reelinsights/more-insight/we-were-children [accessed January 13, 2017]. I’m sad to say that both Hart and Anaquod have since passed on. [iv] Unfortunately, this guide is currently only available to individuals or institutions who are subscribed to the NFB Campus service. [v] A quick pedagogical note: Ensuring that my classroom is a safe space is central to my pedagogy. I show the film on the final day of class, once I had established a good relationship with my students. I announced the film screening and activities in a previous class as a trigger warning. I also made a point of speaking personally with all of the Indigenous students in my class to discuss their feelings about watching the film and, if they chose, to develop an exit plan for them if necessary. I also make available a list of support services available for students, and hold extra office hours for any students who want to speak to me about the film. I should note here that my classes were capped at 35 people, so by the end of the semester if and when I teach in a larger classroom setting, I will likely need to reassess my strategies. Thanks for this! I was thinking about just this topic during this past fall when I taught a History of Sexuality course, especially the week when we talked about the history of trauma and sexual violence. I am not good at being ‘personal’ but this topic was very clearly triggering, while at the same time it peaked many students’ interests and solicited very valuable discussions about how we understand these moments of the past and come to terms with them in the present context. Thank you! It’s definitely a hard line to balance, and something I still struggle with. It’s also a struggle when you want to share how you relate to the past, while also maintaining your authority as a professor. But, I’ve long felt that the key towards getting students engaged with history was to make it personal, so to speak, by enabling them to emotionally connect with and relate to people in the past. It makes the past more real for them.